Mish's Global Economic Trend Analysis: Run on Italy's Third Largest Bank? Capital Controls or Bail-Ins Next? Why Take Chances? The CEO of Monte dei Paschi, Italy's third largest bank, and the oldest surviving bank in the world, admits Customers Pulling Deposits as share prices sink. CEO Fabrizio Viola did not say how much money savers had withdrawn, or when the outflow began, though he said the fall in deposits was "limited" and that the bank could cope with it as he sought to reassure customers and investors. Monte Paschi - Italy's third-biggest bank - has lost the most ground as it is perceived to be the most vulnerable; it has the highest level of bad loans as a proportion of assets and was the worst performer in a 2014 health check of euro zone lenders. "Of course clients turning to our local branches are worried about what they read," Viola said in a statement. "At present the size of the funding lost due to clients who decided to move part of their savings elsewhere is limited and anyway below levels seen during the previous crisis the bank faced in February 2013 which was overcome brilliantly." The problem with statements like "fall in deposits is limited" is that no one can possibly know if they are true. We can't expect Viola to admit the problem is serious. Juncker admitted "When it becomes serious, you have to lie". At the time, he was Luxembourg prime minister. It's Serious! Share prices of Monte dei Paschi are down over 50%, the worst of any major Italian bank. Deposits are leaving, and the only statement we have is that withdrawals are "limited". Bail-ins have already hit other Italian banks. In December, bail-ins at smaller Italian banks wiped out subordinate bondholders. Sergio Picinotti, a 63-year-old unemployed man, lost his entire €40,000 nest egg in Banca Etruria. A friend at the bank said "Trust me, it will take the third world war to shut down Banca Etuuria," said Picinotti. Did a third world war just start? With non-performing loans touching a record high of 201 billion euros ($219 billion) in November and delays in creating a bad bank even as the European Central Bank ups its scrutiny, lenders may be reluctant to make new loans. So far, the ECB’s bond purchase program, known as quantitative easing, has shielded government bonds from the country’s banking woes, with the yield on 10-year debt stable at 1.56 percent compared with a euro-era high of 7.5 percent in November 2011. Italy pays just 101 basis points more than German bunds to borrow for a decade. Italian bank stocks and bonds, however, have not been spared. To further grease the wheels of the economy by speeding up disposals of non-performing loans and free up more resources for credit to companies and households, Italian Prime Minister Matteo Renzi’s government has been trying to win approval at the European level for the creation of a bad bank. The plan has been delayed several times and investors fear recent quarrels between European Commission President Jean-Claude Juncker and Renzi over an alleged lack of budget flexibility won’t make things easier. “If there is a bail-in event this year, Italy is one of the countries where that is most likely to happen,” said Alberto Gallo, head of macro-credit research at Royal Bank of Scotland Group Plc. “Many banks, deprived of a cheap source of funding such as subordinated bonds and having to repay the loans they got from ECB, may find themselves with a reduced liquidity at disposal to boost lending,” Gianluca Ziglio, executive director of fixed-income research at Sunrise Brokers LLP in London, said by phone. “Gone are the days when concerns about NPLs [Non-Performing Loans]could be simply swept under the carpet,” said Wolfango Piccoli, managing director of Teneo Intelligence in London. On January 11, I commented Europe Fears Bail-Ins: Capital Flight Intensifies in Italy, France, Spain; Are German Banks Safe? Here's a table from that post, with Target2 Balances in billions of euros. Viola claims there was a crisis in February of 2013 that was "overcome brilliantly". How many times does one want to bet on that roll of the dice? Let's explore Viola's brilliant comeback idea from the perspective of Target2 balances for Italy (in billions of euros). Between 2008 and 2010, Italian banks had capital inflows. Things went to hell in a hurry starting 2011. By the end of 2012, target2 liabilities of Italian banks hit €255.1 billion. By second quarter of 2014, those imbalances shrank to €149.4 billion. Did Viola do something to spur confidence in Italian banks? 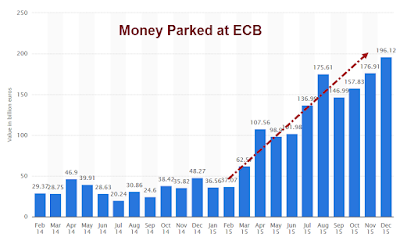 On July 26, 2012, ECB president Mario Draghi made this Famous Statement: "Within our mandate, the ECB is ready to do whatever it takes to preserve the euro. And believe me, it will be enough." On February 14, 2014, Renzi Grabs Power in Italy Without Election. The ECB and the financial markets liked that power grab by Matteo Renzi who then became Italy's prime minister. Money that had fled Italian banks, poured back in, for a while. That honeymoon is clearly over. Care to bet on another "brilliant" comeback? Not a single fundamental problem with Italy, the ECB, the euro, or Europe in general has been fixed. Capital Controls or Bail-Ins Next? In December, only bondholders were at risk. Starting 2016, depositors are at risk, but allegedly only on amounts that exceed €100,000. Don't kid yourself into believing smaller deposits are safe. There are other problems, like capital controls. Greece and Cyprus both have them. In 2015, the ECB imposed Capital Controls on Bank Accounts limiting withdrawals to €1,800 a month. On October 19, 2015, Bloomberg proclaimed A Quick End to Greek Capital Controls? Economists Don't Think So. Even if your money is not stolen, you may not have access to it for quite some time. Viola said the fall in deposits was "limited". I ask "Why Take Chances?" Renzi wants to create a "bad bank". Under new rules, effective 2016, bondholders and depositors are liable for any losses transferred to the "bad bank". Why is the ECB reluctant to approve a bad bank for Italy? Could it be the losses will be massive? Don't be seen Standing in Line hoping for your money when withdrawals are 'limited' via capital controls or outright confiscated by bail-ins. Avoid the rush. Get out now. For further discussion, please see Europe Fears Bail-Ins: Capital Flight Intensifies in Italy, France, Spain; Are German Banks Safe?